Knights and knaves is a classic puzzle most of you will likely have come across already. 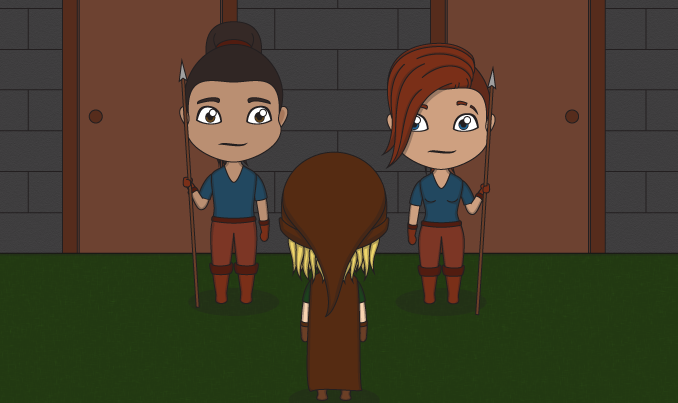 It comes in many different forms, but it generally goes as follows: You come across two doors on your path, guarded by two guards. Only one door goes to where you need, the other will lead you astray. You can ask the guards questions to figure out which door is the one you need to take, but one guard always speaks the truth, the other always lies. You don't know which guard is which, so how do you figure out which door to take? Note that the truth-speaker will be guarding the door you need to go through. Some variants only allow you to ask one question, which is all you need anyway. The answer is simple, but to many it tends to take a while before they figure out the somewhat obvious. The answer, or rather the question you have to ask, is: "If I asked you, would you tell me your door leads to where I need to go?". Why does this work? Because it's essentially two questions in one, which means there'll be two truths (positives) in the case of the truth-speaker, and two falsehoods (negatives) in the case of the liar, which will lead to the answer you need. If you were talking to the truth-speaker you would get the right answer no matter what. So their answer will be yes. If you were talking to the liar you would get the answer "no". Why? Because the answer to "Does your door leads to where I need to go?" would be yes (they lie), so the answer to "Would you tell me your door leads to where I need to go?" becomes "no". They would lie about saying yes. There are many variants of this puzzle, some more difficult than the other. For example, you might have to figure out which door is which, they might speak a different language, or even a combination of everything. The combination of everything resulted in the World's Hardest Logic Puzzle, which I've done a guide on as well. Click the link to read it. In terms of RPG variants and adaptations there's a lot you can do, but most people will already be familiar with this puzzle, so the challenge is often non-existent. Still, it can make for some fun character development and interactions. If they solve the puzzle quickly, a non-player character (NPC) might be very impressed, annoyed, or perhaps suspect cheating. There's plenty of ways to handle it, so have fun. Having said that, the variant of not knowing which guard protects which door is followed by asking the same question as earlier, or one similar to it. "Would you tell me if I asked you if your leads to where I need to go?" If you get the answer of "no", go to the other door. If you get the answer of "yes", go through that door. Why? If true protects the right door, you will get the answer of yes. If true doesn't, you'll get no as an answer. If lie protects the right door, they would say yes. If lie doesn't protect it, you'd get no. The reason is the same as in my explanation earlier.